Below you can find out more about our choice for the best tongue scraper, Dr. Tung’s Tongue Cleaner, as well as some other noteworthy choices. Having tried the best-selling scrapers and brushes on the market, we found Dr. Tung’s to offer the best overall experience. Taking into consideration the price, design, and effectiveness of the clean. 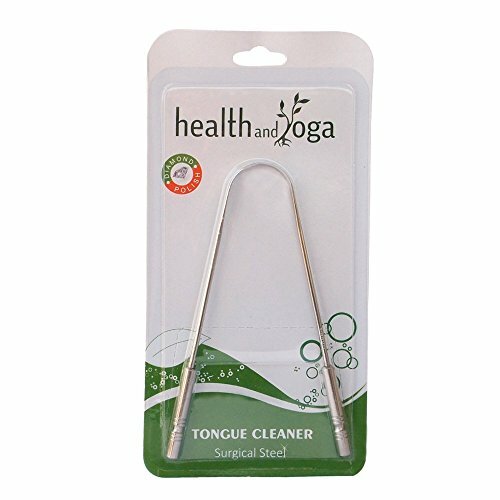 One of the most widely regarded and highest rated tongue cleaners available today, Dr. Tung’s tongue cleaner is made from stainless steel and comes nicely packaged and even has a travel pouch included. The shape of the cleaner is somewhere between a U and a V, with thick rubber grips on the end of the stainless steel to act like handles. There is a nice degree of flex in the material and although steel by its very makeup is strong, it is not too rigid. Thick enough that it does not feel too sharp (in our opinion) when pulled along, it is not so thick that there is no scraping sensation. It could be considered a little harsh on the edge, certainly more so than the HealthandYoga option. The handles can be used as grips as you pull the cleaner from the back of the tongue to the front and can be used either one handed or two handed. Two hands gives a little more control. We did not get a choice of colored rubber grips, but depending on where you buy it you may do. The simple design and metal construction means that you do not need to replace it regularly, and in fact it can last for years. To clean it a simple rinse under warm water or a wipe with a cloth will suffice. The travel pouch is a really great inclusion to not only protect from damage and dirt when travelling with it but just making it easier to access. The design is perhaps a little feminine and a pouch in one solid color would have been preferred, but it is the only one of all the scrapers that includes a pouch at all. Priced at around $6.50 at the time of writing, this is not the cheapest, but has potentially a lifetime of use ahead of it. Even if you price it over a couple of years, it works out a lot cheaper than those designed to be replaced every few months. There are lots of tongue scrapers on the market today and we encourage you to use any over not cleaning your tongue at all. However you might as well opt for one of the better ones right? Here are a selection of other scrapers that we believed to be best among those we tested. We have included a few lines to explain each and what we think about them. Just because we have rated Dr. Tung’s as our choice, need not mean it is the best choice for you. The DenTek Comfort Clean Tongue Cleaner is plastic in construction and is certainly softer on the tongue. This is useful if you do not like the harsher scraping provided by the metal options. With a handle much like a traditional toothbrush, the head is essentially circular with 3 scraping edges that run along the surface of the tongue. It comes neatly packaged with clear instructions on how to use it. The scraper has a ‘mint’ flavour to the scraping edges. We could smell this when held under the nose, but noticed no taste transfer to the tongue during the time we were using it. Whether it had affect on my breath was impossible for us to tell. Whilst the mint flavour was still noticed after our 3 weeks of testing, we can’t really say that this will persist over a longer period. The head itself covers a large area of the tongue and perhaps would require less repetitive strokes as the 3 scraping edges mimic this in many respects. It does feel a little flimsy, and although it not going to break unless excessive force is used, over time the head may become weaker than the metal alternatives. Out of all the scrapers the Orabrush Tongue Cleaner Fresh Breath Brush With Scraper won the tickle test. We found it the least comfortable to use initially. You certainly do become used to it, but the number of bristles that scrape along the tongue surface created a sensation that felt a bit strange. The combination of bristles and scraper work well to clean the tongue. With this scraper we had the feeling that we had really had to put some effort into cleaning our tongue, but the sensation appeared to last longer. This scraper is much like a normal toothbrush, but the head is much wider and there is a different bristle arrangement to normal toothbrushes. The handle was certainly strong and felt like it would stand the test of time. The recommendation from DenTek, the manufacturer of Orabrush, is to replace this every 3-4 months, roughly the same time you would replace a manual toothbrush or an electric toothbrush head. Want to know more about Orabrush? Read our full Orabrush review. The simplistic nature of the HealthAndYoga scraper really won us over. This scraper is an all-metal construction, like Dr. Tung’s, and there are nicely rounded handles/grips at the two ends compared to the rubber with Dr. Tungs. Whilst the rubber tips are easier to hold onto, especially when wet, the end of the scraper tends not to be too exposed to moisture and as such poses little issue. Made of stainless steel, the packaging clearly labelled this as ‘surgical steel’. The difference? Well truthfully none. Surgical steel is often used as a marketing term that applies typically to a particular grade of stainless steel, but there is no official classification of what is surgical steel compared to normal stainless steel. However, these different ‘grades’ do relate to the makeup of the steel with ‘surgical steel’ often meeting grade 316 that helps minimise metallic contamination compared to the 440 and 420 grade that is often used in cutlery. It is not clear what grade of metal is used in Dr. Tung’s scraper to be able to compare. We would be inclined to believe it is 316 but not marketed in this way. Simple but effective packaging, the tongue cleaner does not come with any travel pouch and of the metal scrapers tested, the edges were slightly more rounded and felt to the touch softer, although the strength of the steel means that it still offered a firm scrape. There was certainly flex in the metal but not to the extreme of the others. It was the most likely to spring back to its original shape. There is no denying that this would stand the test of time well and we have no reservations in suggesting that this will be as good in 12 months as it is the moment it comes out the packaging. Perhaps this is why it is the most expensive of all the scrapers tested. The most simplistic of the plastic scrapers, the one from Dental Aesthetics is also the one that offers the sharpest edge. Although they do also offer a ‘deluxe’ version that has more scrapers. Coming in a basic sealed plastic sleeve the handle is basic and functional with rubber grips front and rear and little flex in the handle. It looks a little cheap and basic, but it certainly does the job that it needs to. We chose the lue color rubber grips but you can choose from the options available. Blue was the cheapest at the time of testing. The single scraping edge seems a bit of a waste, another could have been included, but the angle, thickness and effectiveness certainly meant you felt this on the tongue as you pulled it along the surface and you could feel it working. No mint flavours to the plastic here, it is a basic but functional option for getting the job done. The packaging for the Ayurvedic Tongue Scraper is cheap and simple, with ours coming supplied with a card insert that labeled the product. It looked cheesy, dated and unappealing. Not a big issue, but certainly did not win us over. With 6 in the pack this seems good value but when you come to use these you find out why they include 6. This scraper is made of pure copper, like the pipes in your home might be. Copper is quite soft and the thickness of these meant that these are really quite bendy and are easily pushed in and out of shape with too much pressure. The scraping edge was one of the thinnest and least rounded which can be a blessing and a curse depending on how you feel about these. With a more aggressive and acute scrape due to the thinner profile and lack of rounding to the edges, overall the scraper gave that harsher feel to the clean. No real handles are on these either, not that this is a big issue, the turned ends give something to grip to and are not sharp, but do not offer the same comfortable contact points as some of the other options. The copper can go green over time if not cleaned properly, but the use of copper rather than stainless steel is because it is understood that copper has antimicrobial properties. This is in part why it is used for pipework but when used in the mouth for such short periods, and health benefits are hard to justify. With a bit of delicate handling these could offer better value than the HealthandYoga and Dr. Tung’s if you preference is for copper over stainless steel. If you’re not sure why you need a tongue scraper, or why you need to brush your tongue, have a read through the guide below. Most of us know we should clean our teeth twice a day for 2 minutes, whether we do or not is another matter. But what about cleaning your tongue?! Coming into contact with liquids and food stuffs just like your teeth, the tongues textured surface holds onto food debris just as much as your teeth. The front or the tip of the tongue is relatively self cleaning compared to the back part of it which is limited in its contact to naturally cleanse itself. As a result, bacteria builds up on the tongue. So if you suffer from bad breath regularly or even occasionally physically cleaning your tongue with a scraper will go a long way to helping resolve the problem. In fact a study by Pedrazi showed a 75% reduction in the volatile sulfur compounds when using a tongue scraper. Although removing the bcteria and food debris from the tongue will help reduce ad breath, there is no evidence that it reduces the risk of dental decay or gum disease. 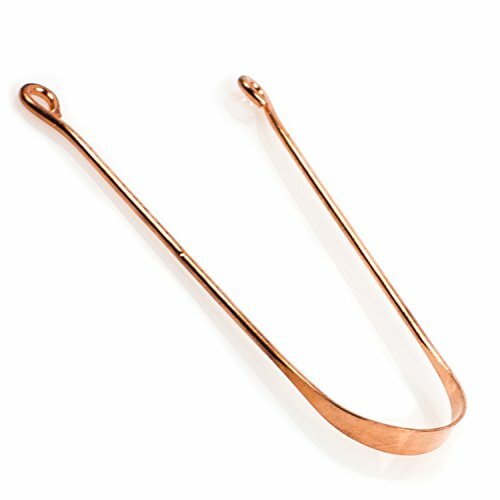 ​A tongue scraper comes in a couple of forms, both of which have the same intention; to remove a thing mucus-based layer of debris from the tongue. 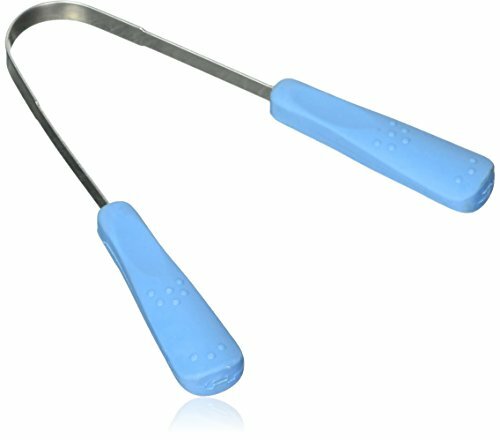 More often than not the scraper is made from a soft flexible plastic and has a design similar to a conventional manual toothbrush, but rather than a small head with lots of bristles it has a larger often rounded design with one or two plastic scrapers running horizontally to the rounded head frame. The alternative design for a tongue scraper is more traditional and more rudimentary looking; a thin piece of machined metal, usually stainless steel or copper, that has been formed into a “U” or “V” shape. It relies on the rounded but strong edge of the metal to scrape away the debris effectively. Tongue brushes also exist. They share a larger sized head like a scraper, but have less bristles than a normal toothbrush and are often made from a soft rubber. Studies by Pedrazzi and Seemann have shown that a scraper can achieve a 75% reduction in volatile sulfur compounds that contribute to bad breath. The American Dental Association suggests there is no real evidence to say that a tongue scraper works better than a brush. But these studies suggested that by using a soft bristled toothbrush, there is some 30% variance in the effectiveness. A toothbrush is said to remove only 45% of the sulfur compounds. 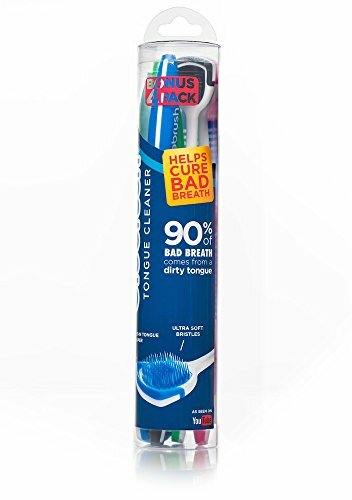 This said, one of the most popular tongue cleaners on the market today, the Orabrush (view on Amazon), is a brush design, but interestingly has a scraper included as part of that design. Some electric toothbrushes have a tongue cleaning mode encouraging you to use your normal toothbrush head rather than a scraper. You can usual a manual toothbrush too. Ultimately any cleaner, be that a scraper, tongue brush or a normal toothbrush head, are more useful to you and your breath than not cleaning your tongue at all. Those who suffer with bad breath will likely see greater benefit from a scraper and for what is just a few extra seconds each day can make a big difference. The process is relatively simple and can be completed in just 7 steps. You can read these simple steps in our how to clean your tongue article. 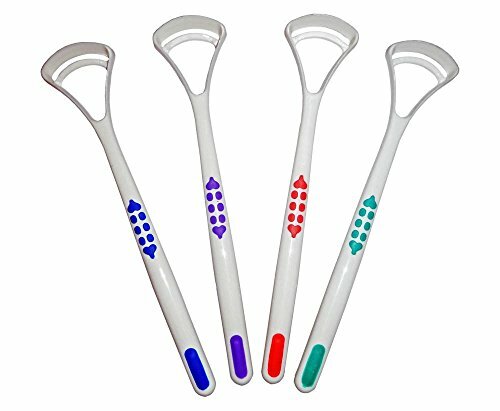 At the time of writing we found Amazon had the most diverse range of tongue scraper on offer. We purchased ours from Amazon and have included links to the various scrapers throughout the article. You can purchase tongue scrapers from most good retailers who sell oral healthcare products be that a pharmacy like CVS and Walgreens or grocery stores like Walmart as well as discount stores like Target. We’ve included a few retail options in the price comparison below, and it’s always worth checking out eBay. This selection and the feedback given is our opinion based on weeks of research and personal hands on testing. You might find you prefer to use your normal toothbrush, you might find the metal tongue scrapers too harsh on the tongue and that is fine. It is about finding what works for you. If nothing else we hope this article has highlighted the importance of cleaning your tongue and helped you on your journey to better oral health care. Have you used any of the tongue scrapers we have tried? Got any comments about them, or maybe you have a question. Perhaps you have found a better option. Leave a comment below as we would love to hear from you.